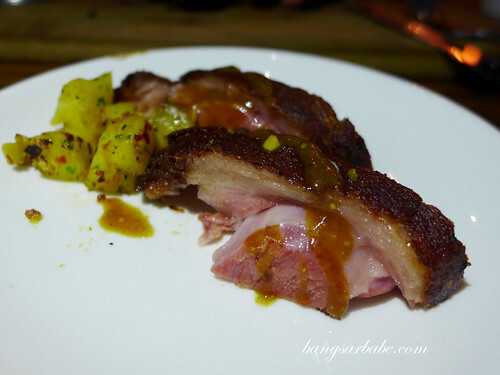 The name Naughty Babe Dirty Duck (NBDD) more or less sums up what the restaurant specialises in – pork and duck. 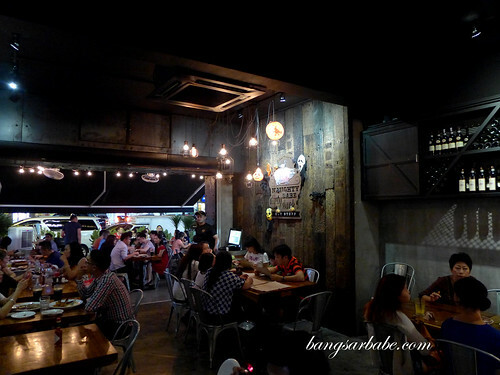 Located in Desa Sri Hartamas, the restaurant interior gives out a ranch-style vibe. 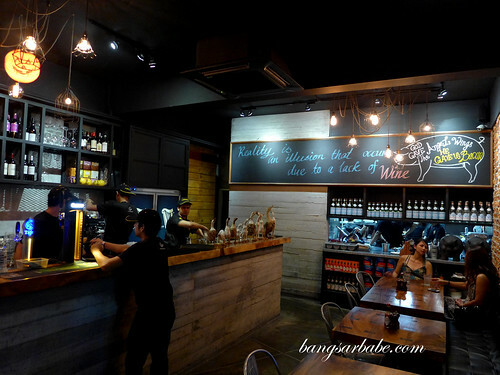 Brick walls, pendant yellow lights, distressed wood and wooden tables; it is casual, bordering hipster. I knew of this place when it opened in April this year, but decided to let the crowd settle before going there myself. The place was crowded when rif and I went but we were fortunate to score a table inside. 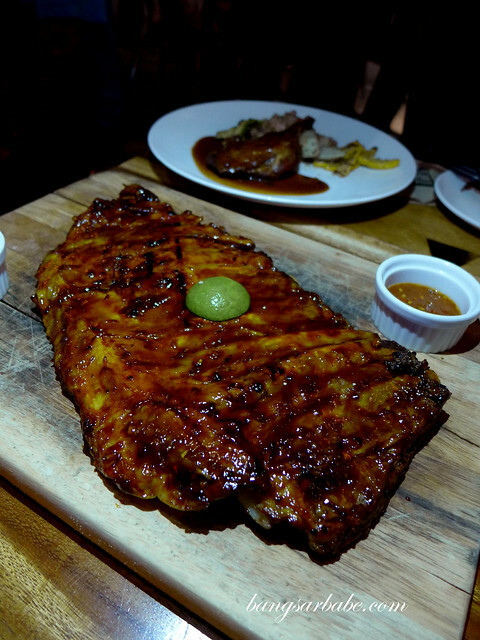 Almost every table had a slab of pork ribs, a specialty of NBDD and also the reason why we wanted to visit. 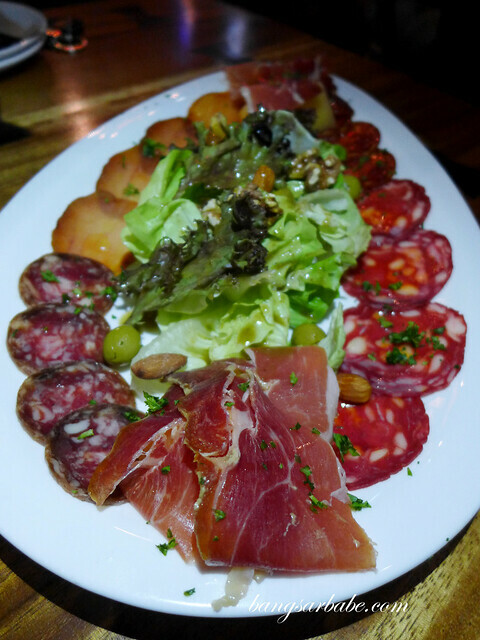 We started with the NBDD Platter (RM58), comprising slices of Serrano ham, chorizo, air dried lomo, olives, nuts and a salad. 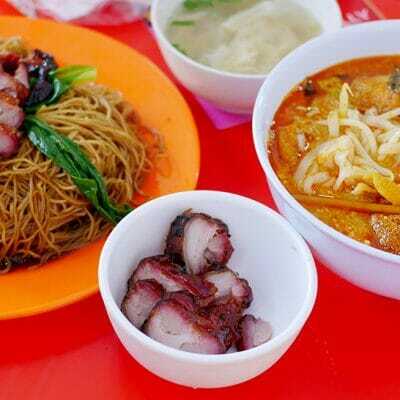 Portion was large enough for 2 or 3 pax and the cold cuts were delicious when eaten with rock melon. 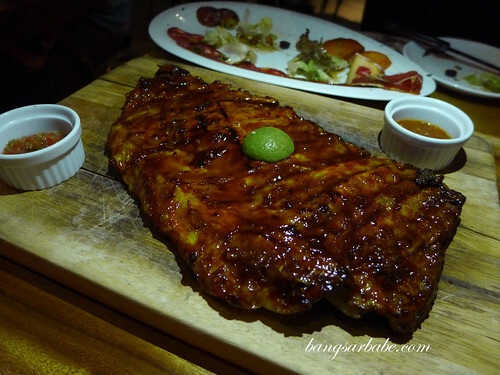 The pork ribs came with two dips – tomato salsa and a house special sauce of shallots and chillies called “hot stuff”. That was hot stuff indeed, complementing the smoky sweetness of the ribs. Don’t forget to squeeze the slight of lime over your ribs for that extra zest. 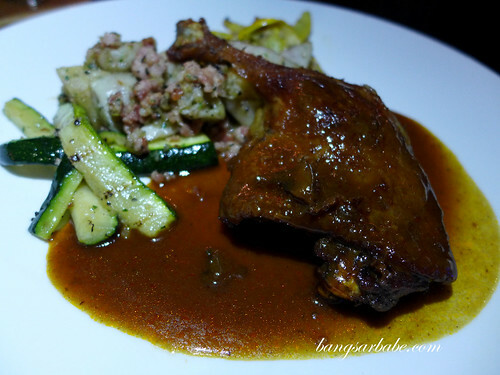 We also tried the signature Dirty Duck, a confit of duck leg with a side of yam with bacon and grilled zucchini. While the skin was fairly crisp and the meat tasty, I wasn’t particularly excited about this dish as I was with the pork ribs. Feeling greedy, we decided to add on another order of crispy pork knuckle (RM98) before we even finished our ribs and duck. That turned out to be a big mistake and a sour note on our night out. We waited almost 45 minutes for the knuckle to be served and by then, the momentum was lost and I was agitated. To make things worse, service throughout the night was terrible. The staff were all over the place and unfriendly. A minor chord given the casual and friendly décor NBDD boasts. I found the pork knuckle disappointing. The skin wasn’t as crisp and some parts were hard, while the meat was dry and difficult to eat. We had to request for extra gravy to lubricate the experience. The side of sautéed tapioca with bacon bits didn’t go down well with us either. We didn’t finish this. On the whole, I didn’t find the food impressive. 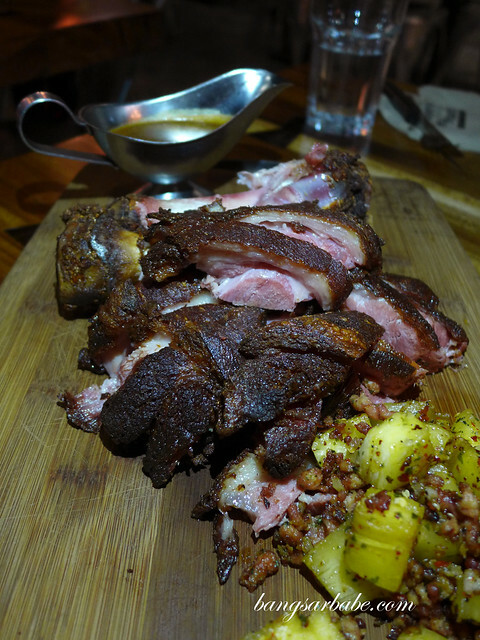 While I would return for the ribs, the poor service and disappointing pork knuckle gives me hesitation. 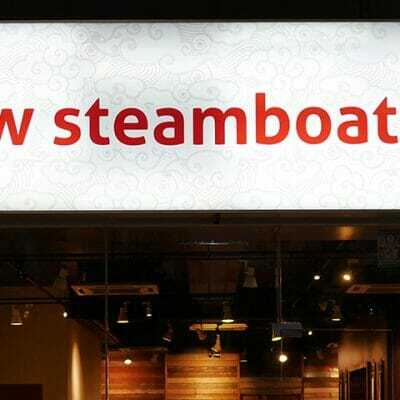 Hard to miss the signboard! Verdict: Pretty decent ribs, but skip the pork knuckle. I think you are an inspiration and I love reading your food articles. Kbye ! The next time you have leftovers, let me know and I’ll happily be the local council garbage collection for you.